Yes, I am STILL absolutely loving lip crayons! These Bourjois Color Boost sticks are a fairly recent addition to the brand's product range. 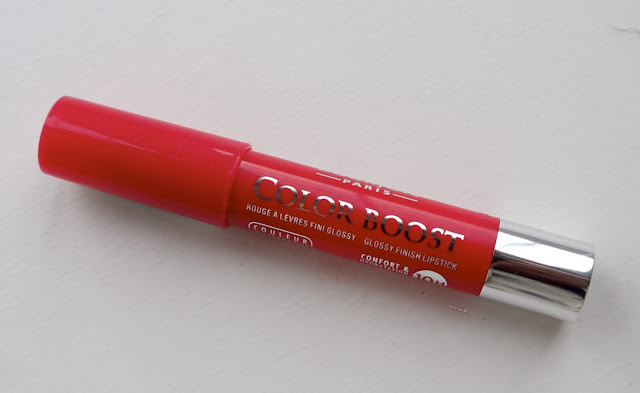 As opposed to other lip crayons I have tried, these ones from Bourjois are much glossier, more of a lipstick/lipgloss hybrid than the other crayons I have tried. The only thing I would question about them is the '10 hour' part. My lips remain hydrated, but the colour certainly needs topping up a few times in a 10 hour period. Therefore, I wouldn't class them as long wear, but they are certainly very moisturising and although the colour range is quite limited at the moment, there is a shade for everyone!